The UC Berkeley Nuclear Forensic Search Project is funded by the National Science Foundation and the Department of Homeland Security. The Project's aim is to enable the discovery of origin of interdicted nuclear materials through the application of digital search technologies. One of my accomplishments was to create scalable vector graphics (SVG) images of nuclear decay chains, as well as traditional HTML and CSS components for the project's website development. I coded a web scraping tool to collect the data on which the graphics are based. As separate charge was to build SQL databases of nuclear site locations which I populated by integrating several heterogeneous datasets. My colleagues and I co-authored four publications about our novel application of search algorithms and our data integration techniques. I also learned how to create SVG images and embed them into the website template (see the Decay Chains page of the project website). Using the model of two SVG decay chain images on the Wikipedia "decay chain" entry page, I created seven additional decay chain images in scaleable vector graphics (SVG). SVG images are built to be scalable, meaning that the image is remains crisp no matter how large or small the image is stretched. Click the static image at the right to play with resizing the SVG version. My charge was to research and compile nuclear facilities datasets from authoritative sources (such as national laboratories and the IAEA labs, etc). In order to do so I integrated multiple datasets, including resolving name variations and differing levels of abstractions between datasets. The result was a database of 500+ nuclear sites (fuel processing facilities, reactors, uranium mines, etc) with geographic coordinates and numerous other attributes. I then transformed the data into a KML file which can be displayed in mapping programs, such as Google Earth. This map was created by Ray Larson, using a subset of attributes in my KML file. Click to invoke a Google Earth map of Worldwide Nuclear Facility Sites. 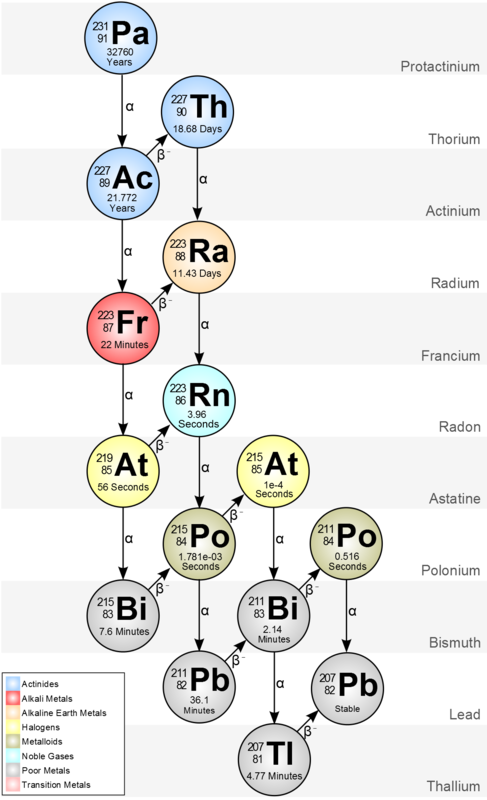 This simple web scraper gathers the data for every element of the Table of Elements from Lawrence Berkeley National Laboratory's website on radioisotopic data. Once this data was scraped and saved into a text file, I used a separate Python script to parse the results into structured data. This data was then used construct the SVG Decay Chain visualizations. 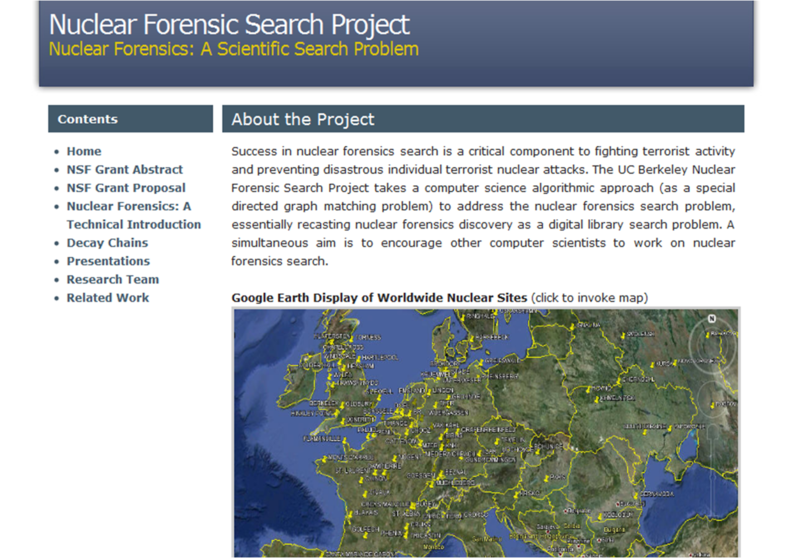 As one of four researchers at my time of hire on the UC Berkeley Nuclear Forensic Search Project, I created the website for the project. I sourced an HTML/CSS template and made extensive modifications to the HTML. These modifications included drafting the original verbiage of the site, and adding images, links, and additional pages. I also modified the CSS to add a new heading level (level 4 in use on the Presentations page) and table formatting (in use on the Decay Chains page). I maintained the website between December 2011 and September 2012.